Want to see your poem, short story, or play in print? 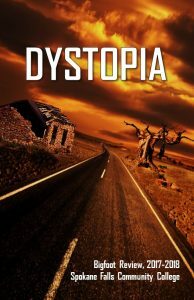 Email subject line: Your Name, DYSTOPIA: Your Story. Email attachment: Your work (3,000 word limit). Files must be Microsoft Word documents. (.doc or .docx) Limit of three submissions per person. Submissions accepted until March 7, 2018 and are open to SFCC Pullman students, faculty, staff, and affiliates. All works should adhere to the theme DYSTOPIA. Authors selected for inclusion will be notified in April 2018.